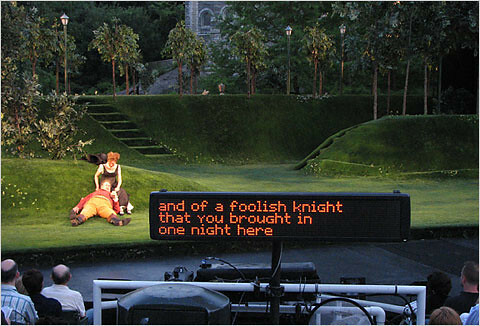 A scene from an open-captioned performance of “Twelfth Night” in Central Park last year. I dislike the metaphors “the” and “disabled.” We are not a generic ” ‘the’ disabled” […] “Universal access” is a metaphor that is appearing quite often, it intends that venues not disable people from attending, participating. That electric door that opens for you, opens for people with disabilities. That curb cut that allows wheelchairs easy access, allows baby carriages the same access. aris_tgd in access_fandom on dreamwidth: Dancing on Wheels ep 3: Simone, Harry, and the reality TV narrative. So the drama in Episode 3 of Dancing on Wheels is interesting because it’s the first time on the show they’ve really talked about the representation of people with disabilities on and because of the show. And given the subject, I’d like to talk about the edit that the producers gave Simone and Harry this week. Connecting to other people who stutter is important to me. People like Marty Jezer, who embrace their identity as someone who stutters, make me more inspired to accept me and my stutter as they are. Celebrities that hide and denounce their stutter as a childhood vice plays into the “inspiring disabled person” story that I and many others detest. Camp is among an estimated 140 million Americans, most of them covered by group insurance plans provided by employers, who are the beneficiaries of a sweeping new federal law designed to guarantee parity in insurance coverage. The law, which took effect for most plans Jan. 1, applies to groups of more than 50 employees and is designed to end what Health and Human Services Secretary Kathleen Sebelius called “needless and arbitrary limits on care.” Higher deductibles, steeper co-pays and other restrictions are no longer allowed for mental health and substance abuse treatment. Officials said that the 25 people were selected to enter the 156-apartment complex in Yonago, Tottori Prefecture, in August and December last year and January this year. A prefectural official reportedly handed over information on the 25, including the name of the householder, the number of people in each home, and data on whether there were elderly or people with disabilities. The official also verbally conveyed the level of disability of three candidates who used wheelchairs. The manager subsequently refused to allow two of the disabled people to enter the apartments. One other person with a hearing disability who was selected in June last year was also turned away by the complex manager on the grounds that he had a disability. It also plays into a problem hinted at above when someone says, ‘Kerb cuts and automatic doors help everybody, not just disabled people,’ – that when we’re seen as some kind of problematic Other, the fact that a lot of disability accommodations are just common sense gets lost and such accommodations get seen as unreasonable. After all, on days when I’m walking, I appreciate an automatic door when I have a lot of heavy bags. If I were pushing a pram, as opposed to using my wheelchair, I’d be happy to find a kerb cut… this kind of thing ought to be remembered when accommodations are being ruled out on the grounds of ‘cost’ or ‘hassle’. I love that captioned theatre performance – it’d be so great if that happened everywhere! The news about freaking equal coverage for mental health benefits is SO AWESOME. I’m betting, however, that my health insurance company will continue to have a separate gateway pre-auth company I have to call for mental health — something that is, of course, very difficult to do if you have depression. “Woodman’s Market, a grocery store chain that employs 2,800 people and is based in Janesville, Wis., is among them. So much WORD on the stuttering post. I would like to see more celebrities open up about it, so it wasn’t this weird, shameful issue. I really dislike the “overcoming” language. Some of us do have some control over our fluency, and some people may sound fluent but aren’t. I’m one of them. I’m constantly aware of what I’m saying, what words are “easier” for me to say, and I have a broad enough vocabulary that I sound strange sometimes but I “pass” as fluent. It’s not ideal for me, but it’s habit now. Particularly fun if one has hearing or speech issues that make the process of calling the company something that practically takes up one’s entire supply of ‘spoons’. And who wants to bet they’ll not know how to deal with a relay call? *blushes* I’m so flattered that y’all featured me! @K — I’m exactly the same way. Most people see me as fluent, but I identify as covert nowadays. I doubt I’ll stay like that for long though. Would like to agree with K that that is an excellent post and so very right. I was boggled when various PWS decided to hold up Joe Biden as the great role model of a successful PWS when he talked about overcoming it. I mean, gee, great, that’s wonderful for you – what about those of us who really truly honestly can’t? And also, from a more personal point of view… it’s hard to gauge stuttering severity because it varies so widely, but I suspect I fall more on the moderate to severe end of the spectrum. I’m not covert and have never been able to pass for fluent except for a short period after speech therapy; it’s only rarely severe enough to really hamper communication, I think, but even in my highly-fluent periods the stutter is definitely noticeable. I don’t mind this so much – speech therapy made me realise that there are things I definitely like about not being able to be covert. It’s easier on my nerves when I don’t have to worry about when people will find out, and I definitely noticed I felt much more ashamed of my speech when I felt as if I had the /option/ to be fluent. So in some ways I’m very glad to have had a more severe stutter and I definitely don’t want to act as if I’m somehow worse off than a covert stutterer. So for my sake, I’d rather people kept their James Earl Jones and Marilyn Monroe and Winston Churchill and Joe Biden and whoever to themselves and instead talked about, say, this lecturer with a stutter.